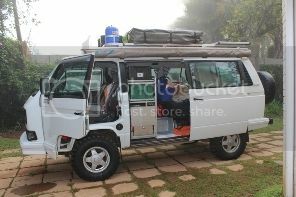 I plan on doing quite a few things to my Syncro before my girlfriend and I leave for our Mozambique trip this winter. I'm going to document it all here. I got a package from Just Kampers today. One of many early Christmas presents to myself. Looks like fun. Those thermo window protectors are a great idea. Looking nice Bruce. When are you planning on going to Mozambique. It's up in the air at the moment. Could be anytime from July to September, going for about a month. I have to recon the gear box first and do my CV's, so basically getting the car ready plays a big role in when I go. (04-09-2015 07:19 AM)Russel Wrote: Looking nice Bruce. When are you planning on going to Mozambique. They work really well, it's nice and cool and dark inside. Hopefully they will allow me to sleep in some mornings. I did a job in Hakskeen Pan last month and had to build a tent around the van to try and keep things cool, also had an external aircon - but it was still way too hot, so these guys will do the trick. If you get some rather get them from GoWesty ( when they have stock ) because they will fit the back windows better - these ones are actually for the bus without the vent in the back window. (04-09-2015 05:50 AM)xavier Wrote: Looks like fun. Those thermo window protectors are a great idea. Who and where are "Just Kampers" please? I see you got the boot protectors for the gear shift rod under the vehicle. I tried recently and they don't seem to be available anymore? If you are thinking of ordering a set please let me know. It's the first time I've bought anything from them and it was a very pleasant experience. They use a courier - DHL ( my least favourite of couriers but better than the post office ) It takes about three days to a week for the stuff to arrive, my postage on the last order was R 700 for a decent size package which was very good compared to ordering from America. I had to pay VAT obviously as well. I'm really tired of going to Barons and Goldwagen and being told I can't get what I'm looking for - it's depressing. It's easier to find parts for the Splitty and Bay. Big thanks. Guess what the wife is getting for Christmas. I have ordered from them a lot of times and have always been happy with the products and service. Definitely more expensive but at least you can get what you need. My bay window's fuel sensor failed a few months ago so I ordered one from them and installed it 3 days later. I think it takes longer to get through customs than to actually get it here. Excellent service.